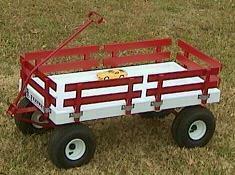 EZ Spreader, an Amish farm supply company, makes a fiberglass bed wagon with superior weather handling. The entire 20"x40" bed bottom is one formed piece of fiberglass, with no wood in the bed. Red painted hardwood racks then slide into the holders, or plastic red racks are also available. The undercarriage is also in red. Unique--Fibrous-glass reinforced epoxy plastic as a wagon bed is truly unusual, but works exceptionally well!